It has been quite an international Twelve Days of Christmas. In fact, judging by past rosters, this was, perhaps, the most culturally diverse line-up at The Restaurant at Meadowood yet. Kobe Desramaults (Day 3) is Flemish, Alexandre Gauthier (Day 4) is French. 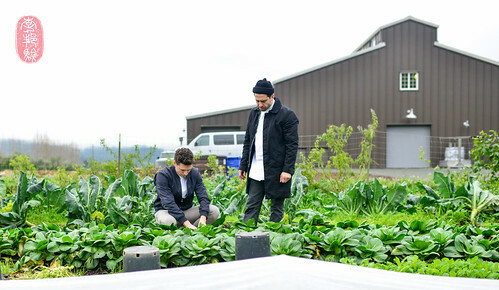 Matthew Orlando (Day 1) is an American expat who opened a restaurant in Denmark, and Esben Holmboe Bang (Day 10), a Dane, is chef of a restaurant with a Finnish name in Norway. Corey Lee (Day 9) is Korean-born, though raised in the United States, where he now cooks. And then came Ignacio Mattos, an Uruguayan chef who owns Estela in New York City, the darling au courant of the American food media. 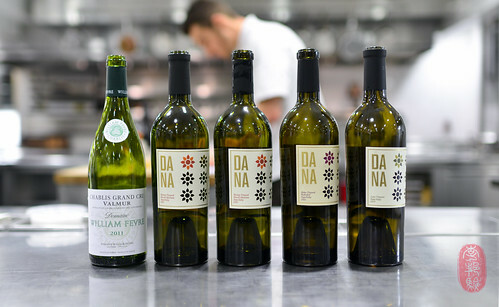 His dinner on the eleventh night, in collaboration with hosting chef Christopher Kostow, was paired with wines by DANA Estates. There are two things I really like about Ignacio Mattos. First, he’s just a really nice guy. Second, when it comes to food, he thinks outside the box. But flavor remains his priority. At first glance, a lot of his dishes don’t seem to make much sense, a meeting of ingredients that you don’t expect to find together: cod with tabouleh, peas and mint, for example, or squid ink-fried rice with romesco; both of which I had at Estela earlier this year. Yet, all of it’s tremendously delicious. A couple of dishes that I had at Estela reappeared this night. Mattos’s beef tartare, mixed with bits of fried sunchoke chips, with more chips scattered on top, was served as a canapé. And those moist, pillowy dumplings, made with ricotta and punchy with cheesy umami (there was a healthy amount of Pecorino Sardo added) – beloved by almost all who have eaten at Estela – were easily the crowd favorite. The dumplings were coated in a buttery sauce and blanketed with a shingled layer of thinly sliced button mushrooms. The sharpness of the cheese and the butteriness of the sauce paired extraordinarily well with the 2011 Domaine William Lafeve Chablis poured with it, perhaps my favorite wine pairing of the entire dinner series. 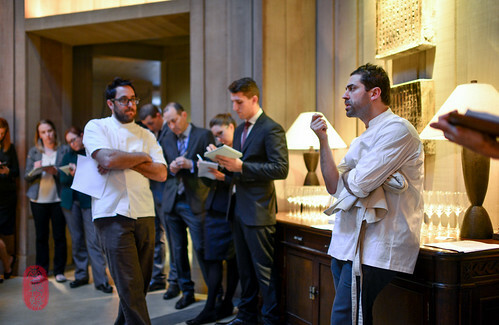 In the middle, Christopher Kostow served one of my favorite dishes from his new menu. He coated black cod with a powder made from sunflower petals and basted it with fat. 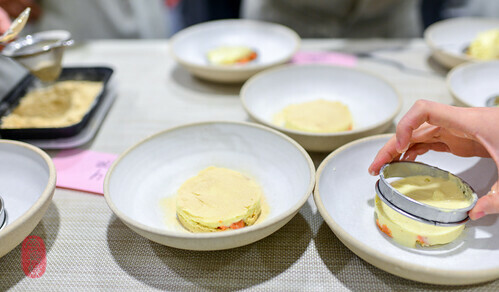 He served the cooked fish with a dollop of creamy sunflower seed butter, sunflower seeds, and a slice of the sunflower cap – which is very similar in form and texture to its cousin, the artichoke heart – pickled in a barigoule-style brine. I especially loved the fattiness of the sunflower seed butter cut by the acidity of the barigoule. 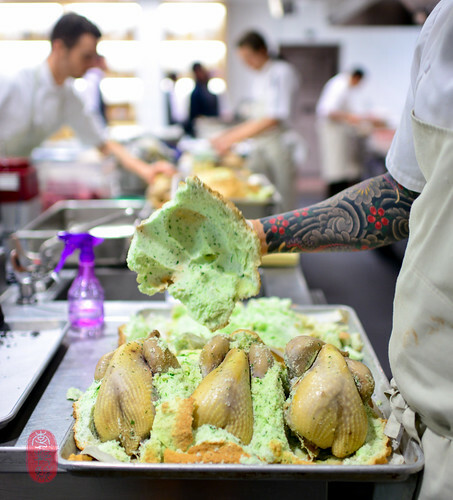 The Restaurant at Meadowood excels at baking en croute, whether it be rutabagas in salt crusts, or chickens in sourdough. For this meal, Kostow buried guinea hens in a salt meringue mixed with leftover trimmings from the restaurant’s garden. Out of the salt shells, the hens were carved, the skins crisped, and the meat was served with a creamy purée of potatoes and matsutakes. For dessert, Christopher Kostow served his take on the old shopping mall favorite, the “Orange Julius” (I haven’t stepped inside of a mall in well-over a decade, but apparently, this franchise still exists, now in partnership with Dairy Queen.). His version included citrus (a variety of it). But the majority of the sweetness came from dates – date purée, as well as small pieces of the dried fruit. Like the original, Kostow’s version was capped with a foamy top of orange froth. It was light and lean, and a treat for so many of us who, like me, I suspect, had all but forgotten about this childhood drink (my last reminder of it was at Eleven Madison Park, where I ordered a cocktail based off of the Orange Julius). Mattos’s dessert was equally simple. First, a layer of custardy vanilla ice cream in a ring mold. This was dotted with little pieces of cooked sweet potato. Then, another layer of the frozen custard on top. And finally, a light dusting of toasted flour, which I assume from an exchange that I had earlier in the day with Jake Nemmers, Mattos’s assistant chef, was all-purpose flour. Earlier, when Nemmers was making the dumplings, I asked him what kind of flour he was using. “AP,” he replied with a smirk. “We don’t use anything fancy at Estela. It’s just simple, good cooking.” And that, I believe, explains why Mattos’s cooking at Estela has become so quickly embraced and celebrated. This was a good dinner. Matsutake, potato purée, tiny greens. ~ by ulterior epicure on December 30, 2014.